Pharmacists Hiten Patel (HP), Manvir Patel (MP), Kirit Patel (KP) and Peter Cattee (PC) travelled in one car through 17 countries for Pharmacist Support. Their ambitious journey started on 12th April in London and saw them cover 12,000 miles in 62 days, reaching their final destination Ahmedabad in India on 12th June 2014. These intrepid travellers have now arrived home and share with us their highs and lows of this incredible journey. What was your stand out moment from the trip? (HP) There were several stand out moments for us during the trip. Visiting the Auschwitz Concentration Camp was a very humbling experience – seeing the suffering fellow humans had to endure there during World War II. Then there were the numerous breath-taking scenic routes throughout our journey, particularly in mountainous Tibet. The views of the North Face at the Everest Base Camp in Nepal were magical. Reaching our highest altitude of 17,000 feet above sea level was thrilling. 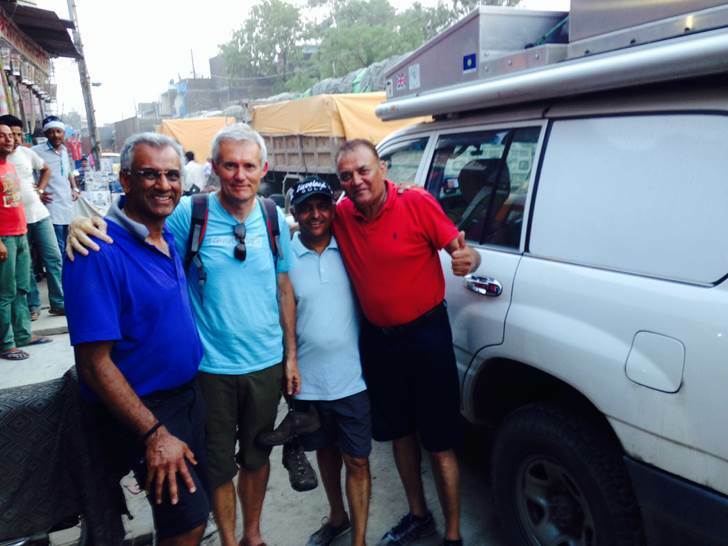 But I think for me personally, when we reached the Nepal-India border and saw the ‘Welcome to India’ road sign, it was an amazing feeling of realisation that we had successfully completed a journey, one which had been on the top of my list and one of the biggest challenges in my life to date. (HP) When we reached Tanggulashanxiang (China) we were at an altitude of 15,000 feet above sea level and didn’t really acclimatise ourselves for the altitude. Walking even fifteen yards became a strain. We all had a few sleepless nights. Battling the oxygen supply at high altitudes was definitely the hardest part of the journey. On one occasion we had to hire a nebuliser so we could get at least some sleep. Dealing with sanitation in some parts of our journey was also quiet challenging at times. Did anything go wrong? And if so how did you handle the situation? (MP) There was no major crisis, except in Tashkent when we had three hours to leave the country because our Visas had expired. This meant a quick dash to the Kyrgyzstan border some three hours away. But we managed to get there in time. Peter and Kirit between them did well to get us there with the help of GoogleMaps! Are there any funny stories from the trek you can share with us? (MP) We had a lot of funny moments; one particular one was when Kirit panicked at high altitude and went about buying various forms of oxygen equipment he could get hold of. So he bought a nebuliser and went to sleep with the tubes attached to his nostrils. (HP) What I would say to anyone wanting to undertake such a challenge for Pharmacist Support is that life is not always easy going and we face tough situations all the time. But it’s the way we accept the challenge that helps motivate us to overcome difficult situations. For this journey we made extensive preparations for over eight months, delegating specific tasks for organising the trip among us, but we knew that this was like a journey into the unknown and no matter how prepared we were, there would be things that would be out of our control that we would have to deal with. One thing was clear in our minds and that was the reason why we did this journey – to support the charity and we were determined to complete the task at hand. If you have the determination to overcome a challenge, no matter how difficult it may appear, you can do it, or at least give it a go! What’s next? Are you planning another challenge or will you take it easy for a while? (HP) This journey was very exhausting, both physically and mentally and it took us over two months to complete the challenge. On route we met some travellers who had been travelling the world for over ten years. I would love to do this all over again, perhaps to a different destination, but am not sure if I will be able to do a similar challenge any time soon. Did the experience change you in any way or have you learnt anything about yourself due to the experience? (KP) I appreciate the time I spend with my family a lot more. I missed them terribly whilst I was away. I found that I had been taking many things for granted, from things like my wife doing my laundry, to having luxuries, such as clean water and food, that some children in China, Nepal and India will grow up never knowing. Finally, if you had to sum up the trek in one word, what would that be? For further information about the trip and to make a donation visit the Four Pharmacists in One Car Justgiving page. Donations help us to provide a range of confidential support services from a stress helpline and addiction support to home visits for isolated and elderly pharmacists and widows/widowers of pharmacists. So far this challenge has raised over £500 which will help towards funding charity services and help future pharmacists and their families, former pharmacists and pharmacy students face life changing events.